Thanks Mike! That makes perfect sense. I guess another way to state it is if we go .500 the rest of the way, we'll still be 10 games over .500. Senior year at USF finishing up my BSEE degree. Those (and the few years prior) were some fun times in the dome. Actually had to go stand in line early in the day to score tickets. I was a freshman and at every game!! Just getting to USF that summer. Beta Hall baby!! Beta 3 West that year as well!! Extra curricular activities at C. Leon King High school and found a tv where we watched the end of the USF/Georgetown game. In the middle of the Pacific Ocean on an Island designed to look like a giant Aircraft Carrier, Johnston Atol. In ‘92 I was a USF alum and had season tickets in the Swamp to see my beloved Gators. I couldn’t have been a bigger Gator fan. 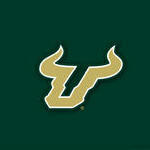 Watching USF MBB in the NCAAs.